When one of the world’s leading specialist insurers commissioned an installation to reflect both the identity of the organisation and the vital data that informs their business, one particular material met all the aesthetic and performance demands of the brief. 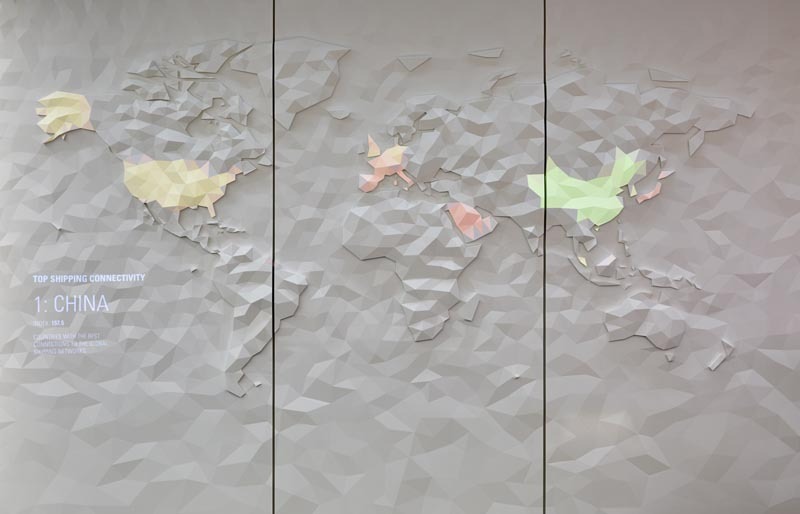 Created by The Agency of Design, a digitally augmented, sculptural mural made from Corian® now greets visitors to the London offices of Liberty Specialty Markets. In order to manage an international portfolio covering a range of high-value items from artwork to aircraft, Liberty Specialty Markets evaluates a significant amount of global information on a daily basis. The concept for the 5.7 x 2.8m wall behind in the reception of LSM’s headquarters at 20 Fenchurch Street (also known as the ‘Walkie-Talkie’ building) was to embody the essence of this expertise and its source data in an artistic, distinctive and adaptable way. The design team worked in a fully consultative process with the client to develop the ideas; “Liberty Specialty Markets had a creative approach to working with us, respecting our abilities and giving us breathing room, while supporting with ideas and information when we needed it,” says Matthew Laws, co-founder of The Agency of Design. Thus the dramatic vision for an impressive and interactive ‘Living Atlas’ began to take shape. The five separate panels in the Glacier White color of Corian® were digitally cut and carefully glued and hand finished to form the faceted 3D surface. 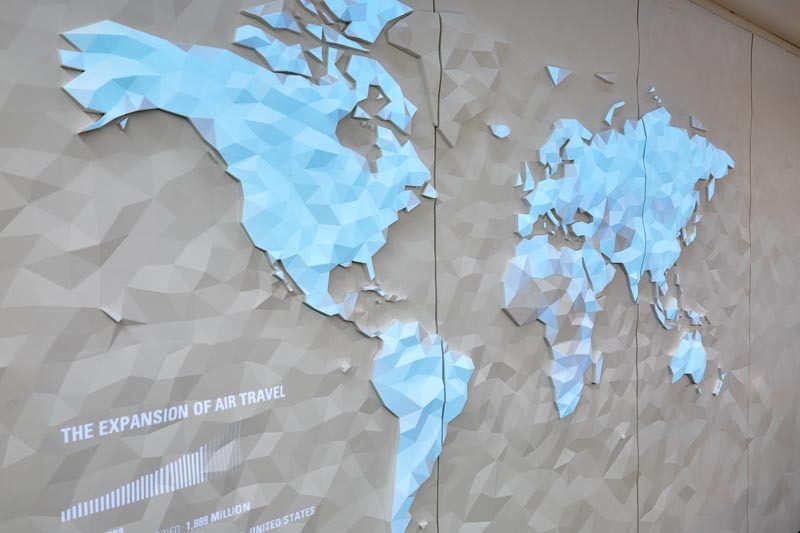 The animations and textures appear by using a high resolution projector exactly mapped to the faceted surface. The physical surface is designed to look equally beautiful and complete with or without projection, thus meeting a key requirement of the brief from LSM, which was to be able to ‘switch off’ the data. It is this integration of information, however, that gives the installation a key and very personal part of its unique fascination. Although striking backlit effects are among the many possibilities of working with Corian®, it became clear that projecting onto the material offered greater versatility in this case. Early explorations were based on a much larger faceted map lit from behind using RGB LEDs,” explains Matthew. To develop the animations that are currently projected onto the mural, The Agency of Design continued to work closely with LSM through a series of creative workshops, both to gain a clearer understanding of the essence of their business and to foster a sense of collaboration and ownership over the project. Completely customised software was then created in order to make the vision a reality. Final animations included hundreds of flight paths, millions of insured locations, and 100 years of storm path data, including a ‘current storm’ animation that references a web-based dataset of live GPS storm locations. As testament to the imagination and faith invested in the project by both designer and client, the Living Atlas is a finalist in the Commercial Interior Surface category of the UK’s Surface Design Awards.